Dennis B. Ross (born November 26, 1948) is an Middle East coordinator under President Bill Clinton, and was a special adviser for the Persian Gulf and Southwest Asia (which includes Iran) to the former Secretary of State Hillary Clinton. Ross was born in San Francisco and grew up in Marin County. His Jewish mother and Catholic stepfather raised him in a non-religious atmosphere. Ross graduated from University of California, Los Angeles, in 1970 and did graduate work there, writing a doctoral dissertation on Soviet decision-making. He later became religiously Jewish after the Six Day War. In 2002 he co-founded the Kol Shalom synagogue in Rockville, Maryland. During President Jimmy Carter's administration, Ross worked under Deputy Assistant Secretary of Defense Paul Wolfowitz in the Pentagon. There he co-authored a study recommending greater U.S. intervention in the Persian Gulf region "because of our need for Persian Gulf oil and because events in the Persian Gulf affect the Arab–Israeli conflict." During the Reagan administration, Ross served as director of Near East and South Asian affairs in the National Security Council and Deputy Director of the Pentagon's Office of Net Assessment (1982–84). Ross returned briefly to academia in the 1980s, serving as executive director of the Berkeley-Stanford program on Soviet international behavior from 1984–1986. In the mid-1980s Ross co-founded, with Martin Indyk, the American Israel Public Affairs Committee (AIPAC)-sponsored Washington Institute for Near East Policy ("WINEP"). His first WINEP paper called for, among other things, appointment of a "non-Arabist Special Middle East envoy" who would "not feel guilty about our relationship with Israel." In the administration of United States State Department's Policy Planning Staff, working on U.S. policy toward the former Soviet Union, the reunification of Germany and its integration into NATO, arms control, and the 1991 Gulf War. He also worked with Secretary of State James Baker on convincing Arab and Israeli leaders to attend the 1991 Middle East peace conference in Madrid, Spain. Although Ross had worked for outgoing Republican President Bush (even assisting in his re-election effort), incoming Democratic Secretary of State Warren Christopher asked Ross to stay on for a short time to help with early Middle Eastern policy in the new administration. In the summer of 1993 President Bill Clinton named Ross Middle East envoy. He helped the Israelis and Palestinians reach the 1995 Interim Agreement on the West Bank and the Gaza Strip and brokered the Protocol Concerning the Redeployment in Hebron in 1997. 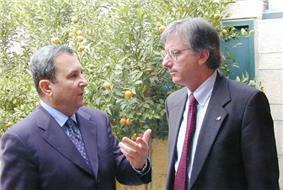 He facilitated the Israel–Jordan peace treaty and also worked on talks between Israel and Syria. Ross headed a team of several people in the Office of the Special Middle East Coordinator, including his deputy Aaron David Miller, Robert Malley, Jon Schwarz, Gamal Helal, and Daniel Kurtzer (until 1994). Ross, consulting his team, drew up the Clinton Parameters as a bridging solution to save the Israeli–Palestinian negotiations in December 2000. Ross was criticized by people on both sides of the conflict. Former Palestinian Foreign Minister Nabil Shaath described him as being more "pro-Israeli than the Israelis." Occasional references to his Jewish ancestry were brought up within the Arab world (although Ross maintains this was not a problem with other heads of state during negotiations), while some conservative Israelis branded him "self-hating"—each questioning his ability to be unbiased, though Palestinians involved in the negotiation process would insist that his perceived lack of objectivity had little to do with his religion. Describing Ross, Roger Cohen wrote that "Balance is something this meticulous diplomat [Ross] prizes. But a recurrent issue with Ross, who embraced the Jewish faith after being raised in a non-religious home by a Jewish mother and Catholic stepfather, has been whether he is too close to the American Jewish community and Israel to be an honest broker with Iran or Arabs. Aaron David Miller, after years of working with Ross, concluded in a book that he 'had an inherent tendency to see the world of Arab–Israeli politics first from Israel's vantage point rather than that of the Palestinians.' Another former senior State Department official, who requested anonymity ... told me, "Ross's bad habit is pre-consultation with the Israelis." Ross was a noted supporter of the Iraq war and he signed two Project for a New American Century (PNAC) letters in support of the war in March 2003. However, he opposed some of the Bush Administration's policies for post-war reconstruction. He also opposed Bush's policy of avoiding direct talks with Iran. According to The Wall Street Journal, Ross, along with James Steinberg and Daniel Kurtzer, were among the principal authors of presidential candidate Barack Obama's address on the Middle East to AIPAC in June 2008. It was viewed as the Democratic nominee's most expansive on international affairs. Ross was appointed Special Advisor for the Persian Gulf and Southwest Asia to Secretary of State Hillary Clinton on February 23, 2009. On June 25, 2009 the White House announced that Ross was leaving the State Department to join the National Security Council staff as a Special Assistant to the President and Senior Director for the Central Region, with overall responsibility for the region. The Central Region includes the Middle East, the Persian Gulf, Afghanistan, Pakistan and South Asia. Benjamin Netanyahu to freeze settlement construction during negotiations with the Palestinian National Authority, in exchange for unspecified private assurances and a major military arms transfer from the United States. Palestinian officials reportedly viewed Ross as beholden to the Israeli government, and not as an honest broker or even-handed facilitator of negotiations. For a significant period, Ross refrained from meeting Palestinian Authority officials, while continuing to hold talks with Israeli officials during his visits to the region. On November 10, 2011, Ross stepped down from his post in the Obama administration. He currently serves on the advisory board for DC-based non-profit Walsh School of Foreign Service as the Distinguished Professor in the Practice of Diplomacy. In their 2006 paper The Israel Lobby and U.S. Foreign Policy, John Mearsheimer, political science professor at the University of Chicago, and Stephen Walt, academic dean of the Kennedy School of Government at Harvard University, named Ross as a member of the "Israeli lobby" in the United States. Ross in turn criticized the academics behind the paper. In 2008, Time reported that a former colleague of Ross, former ambassador Daniel Kurtzer published a think-tank monograph containing anonymous complaints from Arab and American negotiators saying Ross was seen as biased towards Israel and not "an honest broker". Ross's memoir of his experiences, neoliberal foreign policy which relies on a much broader and more effective use of statecraft. While having worked under both Republican and Democratic administrations, Ross himself is a Democrat. Ross states in The Missing Peace that he and other American negotiators pushed Israeli Prime Minister Ehud Barak to accept Palestinian sovereignty over Arab neighborhoods of East Jerusalem during the Middle East Peace Summit at Camp David. Ross wrote part of Barack Obama's speech to the American Israel Public Affairs Committee during the 2008 Presidential campaign, and the speech stated that "Jerusalem is Israel's capital" and that it should not be divided again. The Jerusalem Post reported in November 2008 that, according to Ross, these were "facts." However, Ross stated that the "third point," which is the position of the United States since the Camp David Accords, is that the final status of the city will be resolved by negotiations. Reforming the Palestinian Authority: Requirements for Change. Policy Focus #43. Washington Institute for Near East Policy. August 2002. Foreword for: Levitt, Matthew (May 1, 2006). Hamas: Politics, Charity, and Terrorism in the Service of Jihad. Statecraft: And How to Restore America's Standing in the World. Myths, Illusions, and Peace: Finding a New Direction for America in the Middle East, with David Makovsky, Viking, 2009, ISBN 0-670-02089-3 ISBN 978-0670020898. Clayton E. Swisher (2004), The Truth About Camp David: The Untold Story About the Collapse of the Middle East Peace Process. New York: Nation Books. ^ Landler, Mark (2009-02-24). "Negotiator picked for post at U.S. State Dept.". New York Times. Retrieved 2009-02-24. ^ a b c d e However, Ross reportedly did not obtain a PhD from the University of California. "Dennis Ross". The Washington Institute for Near East Policy. Retrieved 28 September 2014. ^ James Mann, Rise of the Vulcans: The History of Bush's War Cabinet, Viking, 2004, 79–81. ^ Clayton E. Swisher (2004), The Truth About Camp David: The Untold Story About the Collapse of the Middle East Peace Process. New York: Nation Books, p. 35. ^ Swisher, The Truth About Camp David, p. 39. ^ Aaron David Miller (2008). The Much Too Promised Land: America's Elusive Search for Arab-Israeli Peace. Random House. p. 239. Retrieved October 6, 2014. ^ Ross, Dennis (2005-06-01). The Missing Peace: The Inside Story of the Fight for Middle East Peace. Farrar, Straus and Giroux. p. 725. ^ Quoted in Swisher, The Truth About Camp David, p. 32. ^ "Tired are the peacemakers: tales from the Arab-Israeli negotiating table", Washington Monthly, September 2004. ^ Avi Shlaim, "The Lost Steps", The Nation, August 30, 2004. ^ Swisher, The Truth About Camp David, pp. 148–49. ^ Roger Cohen, "The making of an Iran Policy," The New York Times Magazine, July 30, 2009. ^ Project for a New American Century "Statement on Post-War Iraq," March 19, 2003 at the Wayback Machine (archived August 12, 2007) and "Second Statement on Post-War Iraq," March 28, 2003 at the Wayback Machine (archived August 12, 2007). 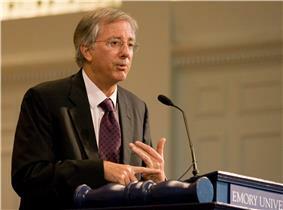 ^ "President Obama's Mid-East adviser Dennis Ross resigns". ^ "Dennis Ross". School of Foreign Service. 2015. Retrieved July 15, 2015. ^ a b Clyne, Meghan. "Kalb Upbraids Harvard Dean Over Israel", New York Sun, March 21, 2006. Accessed August 17, 2007. ^ Frankel, Glen. "Book Review: So Close and Yet So Far," Washington Post, August 22, 2004, BW06. ^ "Exhausted Are the Peacemakers," New York Times Book Review, 2004. ^ Hirsch, Jordan. "StatecraftReview of ," Columbia Current. ^ The Missing Peace, Dennis Ross interviewed by Nonna Gorilovskaya, Mother Jones October 20, 2004. ^ Dennis Ross. August 2004. The Missing Peace: The Inside Story of the Fight for Middle East Peace. Farrar, Straus, and Giroux. ISBN 0-374-19973-6.